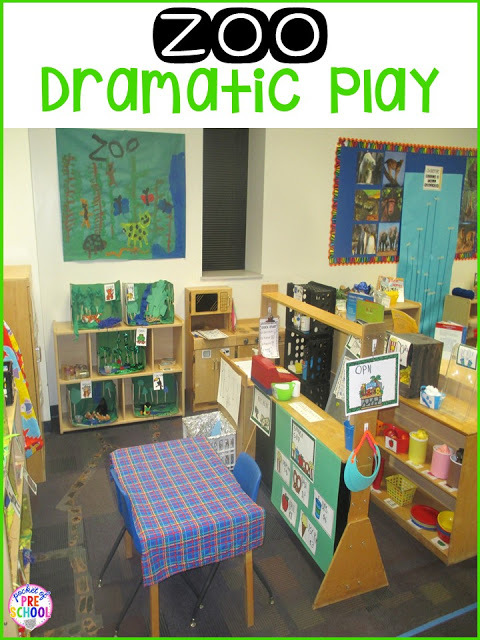 Turn your dramatic play center into a ZOO! Trust me, it is amazing and your students will LOVE it (and learn a ton too). It’s a theme you can do anytime during the year. I usually do ZOO toward the end of the year because the pretend roles and vocabulary are more complex. This is our Zoo at the END of the study. There were empty shelves when we started. The first week, we spend 3 days making props, making signs, and making habitats for the zoo so the dramatic play center was not open for play. It was only open for prop making while we set it up. The first week, we read books about zookeepers, buddy read books about zoo animals, and watched videos of real zookeepers in action to build background knowledge. At circle, students wrote and drew supplies we needed to create our zoo, animals at a zoo, habitats, the different people at a zoo, and the different places at a zoo on white Post-It notes. Our Zoo theme lasted 4 weeks. Each week we focused our learning on a different habitat. During small group, students created habitats. The first week was rain forest week so we focused on rain forest animals. I had gathered books and photos on 5 different rain forest animals. Students could choose what animal they were interested in to research! Day 1, students “researched” their animal. YES preschoolers CAN research! They looked at photos and books about their animal with their group. Students drew a picture of the habitat and wrote about the habitat at their level. Students noticed simple things “lots of trees”, “plants everywhere”, “plants and rivers” or “vines”. During circle, we also watched short videos of the animals in their habitats! Day 2 and 3, students created their animal’s habitat based on their research. Students made trees, waterfalls, bushes, vines, and rocks using the supplies! If you are wondering, yep this is STEM in action (and tons of literacy)! What supplies did we use? I basically just grabbed all kinds of green and blue art supplies from the cabinets (crape paper, string, construction paper, craft sticks, tissue paper, gift bag stuffing). The boxes are copy paper boxes and diaper boxes with one side cut off. Students painted the inside of the boxes green. Students added signs after the habitats were dry and we put them in the zoo! Zoo animal habitats are my favorite project by far! How amazing are these! They worked so hard on them! Week two was all about the savannah so for three days during small group, students researched and created habitats for various animals that live in the savannah. And yes I do own a ton of Beanie Babies from when I was a teenager. You could use stuffed animals or plastic animals instead. The mini Beanie Babies are from McDonald’s Happy Meals. I took photos of each group with their habitat, holding their research for their portfolios. If you could see their faces, they were beaming! They were so proud of themselves and so was I. They were even showing their parents their habitats during drop off and pick up! We had a group of students who were fascinated with bugs. So we turned our doll house into an insectarium. We are lucky and have a HUGE insectarium at our zoo in St. Louis that many of my students had visited. Students started the insectarium week one. They worked on it and played in it for the entire four week study! You can’t have a zoo without a snack shop! Students helped make the signs and decided what food they wanted to have. Making signs is a super easy way to sneak in tons of literacy and math (if you have prices on the signs). Students told me we needed a footprint path for our pretend zoo. We looked at photos of animal footprints for support. It was fun to compare the footprints shape, size, and characteristics. Plus when they pretend to be the visitor they can follow the path as they walk around the zoo! You don’t need a ton of props for the zookeepers. Tools we used were small buckets, sponges, empty water bottles, washcloths, toothbrushes, baby bottles, a piece of a hose, empty bottles, and cans with “food”. We used cut up pipe cleaners and round counters for “food”. Students would pretend it was all kinds of different food depending on the animal they were feeding. Just look at these zookeepers in action! They are cleaning the cage, brushing the tigers teeth, feeding the baby giraffe a bottle, and scooping up “poop” (their idea, not mine). They LOVED pretending to be a zookeeper! Plus they were learning about an animal’s wants and needs. Students could pretend to be a visitor. They would walk along the path to look at the animals, take pictures, use zoo maps, take tours, ask the zookeepers questions, and drive home. The square taped to the floor is the “car”. These visitors are just came from the snack shop! They are sharing a bag of popcorn and discussing what animals they want to see next. There is a TON of vocabulary and language happening when students are pretending. They are listening to each other (hopefully right), talking with each other, and using props related to the theme. Don’t be afraid to use big words with your little learners. If they can say tyrannosaurus rex, they can say anything! Students could also be a guide. The guide sold tickets, worked at the snack shop, and gave tours to the visitors. I always try to embed as many learning experiences as I possibly can into their play. I wanted to add a sorting experience so I added the colored pipe cleaners (long food) and the circle counters (round food). Students would have to sort the food during clean up. Some students even picked out certain colors to use for food! I added real maps from our zoo for students to use. Students also created maps for the zoo. At the snack shop, students are counting money as they pay, identifying numbers on menus, and writing numbers on receipts. Making the dramatic play center a Zoo is amazing! You should totally do it! 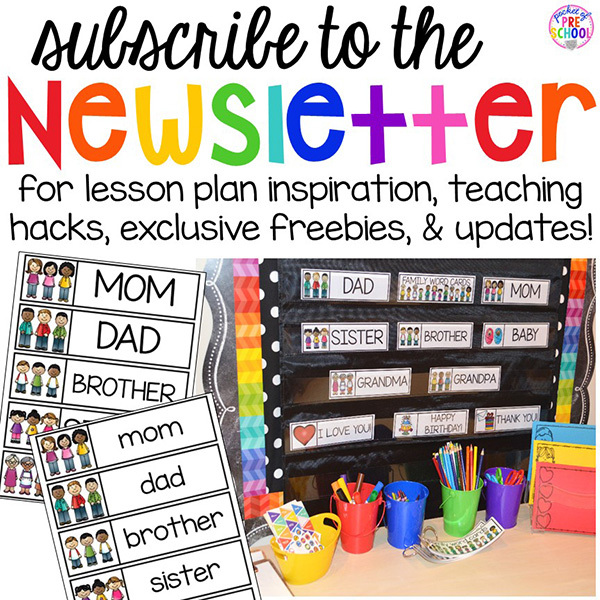 Want all my Zoo printables? Go grab Zoo Dramatic Play HERE. 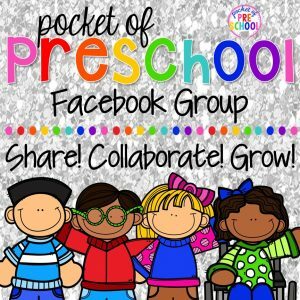 I made everything for you including signs, labels, menus, zookeeper reports, research pages, parent letter, pretend money, prop lists, and more. Take the zoo theme all over your classroom using Zoo Math and Literacy Centers and Habitats STEM I Can Build. Just print, prep, and teach! Love it? Pin this image now! Need more zoo inspiration? Follow my Zoo Theme Pinterest Board!